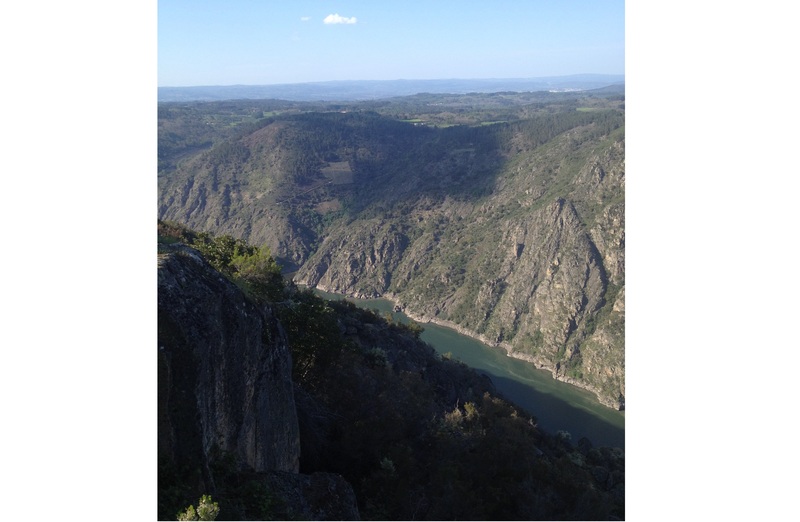 In a corner to the south-east of Galicia, in the heart of the Ribeira Sacra, we can find the Sil’s Canyon (Canóns do Sil), a gorge excavated by the Sil river passing through Ourense and one of the most spectacular landscapes in the whole region. The Sil’s Canyon covers the last 25 kilometers of the river before its mouth in the Miño, in the town of Os Peares. If we add to these kilometers those corresponding to the part of the river Miño, the length of these valleys reach around 50 kilometers. It is, therefore, one of the most attractive river routes in our country. In addition, on its steep walls you can visit numerous viewpoints, monasteries and churches from where to enjoy a dreamlike view. Although the formation of the Canyons is mainly fruit of the erosion of the waters in the granite stone throughout the centuries, the truth is that it is also aided in part by the presence of a tectonic fault that produces the depression. For all this, this place is considered Place of Community Importance. Canyons can be visited in different ways. You can go by road, hiking in its infinite paths or sailing its waters. Perhaps it is this last mode the most magical of all, because it allows us to appreciate the spectacular reflections of the landscape in the water and also its unevenness, with slopes that become almost vertical at some point. In addition, the route by the river allows access to otherwise inaccessible places. From the boat you can also see the famous Monastery of Santa Cristina de Ribas do Sil, a church dating from the 12th century and whose interest lies in its Romanesque rosette and Renaissance cloister (from the 16th century). It is said that on its apse there was a tunnel entrance years ago. Tradition says that if you pass through the hollow chestnuts in the environment all the evils heal, but this is just one of the thousands of stories and legends that surround this impressive place. Although there is much to see along the Sil canyons, the top places to go are its viewpoints, authentic natural watchtowers from which some of the most impressive landscapes of Galicia are mastered. Some of the most important are Mirador del Duque, Peña do Castelo and Balcones de Madrid. Its imposing monasteries are another of the elements not to be missed. Especially extraordinary is the Monastery of Santa Cristina de Ribas, a magical place that will surely fall in love. Everyone should also see the vineyards cultivation system, arranged in bacanales or “terraces”, used since the Roman times that show the enormous effort of the man to take advantage to the last corner of land. Perhaps because of this, when we talk about this area we talk about “heroic viticulture”. In the beginnings of Christianity, monks and hermits came to this area to search for the silence and the extraordinary nature of these lands and, over time, built monasteries of great importance. Hence the name of Rivoyra Sacrata (Ribeira Sacra), of which there is written evidence from the twelfth century. But in addition to monasteries, this area of ​​Galicia has a valuable heritage made up of castles, country houses, churches and bridges. On one of the banks of the river is the Monastery of Santo Estevo de Ribas de Sil, a Benedictine monastic group dating from the sixth century and now, after its rehabilitation, used as a hotel. If there is a notable element in this monastery it is its Romanesque cloister, but also has Gothic, Renaissance and Baroque elements. Perhaps for this reason he received in 1923 the recognition of Historical-Artistic Monument.